This page provides information on the background and definitions, the main CEPT deliverables for Private/ Professional Land Mobile Radio as well on the current activities in PT FM54 on 'PMR/PAMR' Land Mobile Radio and national contact points from CEPT administrations. The spectrum and harmonisation needs for private/ professional land mobile radio systems (often shortly 'PMR/PAMR') have been investigated in the ECC for many years. Adequate levels of harmonisation require a long term effort from the ECC and CEPT Administrations at national level. Such land mobile systems typically can support the industrial sector, transportation sector (including airports and railways) and governmental sector (blue light forces, but also e.g. embassies), life saving services, cross border links, the energy/utilities sector (smart metering/smart grids), hotels/tourism sector, financial sector, the agricultural and forestry sector, the retail sector, or electronic communications for the public.Typically, technical implementations can be differentiated into three tiers: a) direct peer-to-peer communications, b) communications between a base station and mobile user equipment, and implementations c) with a common control channel (trunking systems). The Radio Spectrum Policy Group published in 2013 an RSPG Report on Sectoral Needs including a strategy how to deal in future with PMR spectrum requests as well as requests for spectrum from various market sectors which could potentially also use PMR-based solutions. ECC Decision (01)03 includes in its Annex 2 the terminology that is used for land mobile systems, in the ECA Table as well as in the EFIS database. Note that the PMR446 'walky-talky' application is different from normal PMR/PAMR and provided under general authorisations. The new ECC Decision (15)05 allows for an all analogue and digital use in the whole frequency range 446.0-446.2 MHz which is planned to be harmonised on EU level by 2018 by updating and amending the EC Decision for SRDs. ECC Report 25 of 12 June 2003 included 'Strategies for the European use of frequency spectrum for PMR/PAMR applications, in particular within the bands 410-430 MHz, 450-470 MHz and 870-876/915-921 MHz'. The bands 406.1-410 MHz and 440-450 MHz were not foreseen for further harmonisation and reorganisation initiatives. The frequency band 380-400 MHz was not included in the plan as parts of this frequency band are a preference band for PPDR. A review of the assessments made in ECC Report 25 is on-going. Many of the future spectrum requirements for PMR/PAMR as seen in 2003 have not materialised. A real free up of frequencies in 410-430 MHz and 450-470 MHz has not taken place. PMR/PAMR usage in 870-876/915-921 MHz has not materialised to a great extent (e.g. TETRA 900 specifications have been withdrawn) and neither PPDR implementations in 380-385/390-395 MHz nor GSM-R has really helped to free spectrum in the 400 MHz range. Within the ECC, WGFM conducted in 2014 a survey with CEPT administrations and industry about the use of the 400 MHz PMR/PAMR frequencies. The results are available here (zip-file). The responses from 32 CEPT administrations showed about 13 000 narrowband PMR/PAMR licenses in 410-430 MHz, about 31 000 in 440-450 MHz and 58 000 licenses in 450-470 MHz. The total estimate over CEPT is about 120.000 narrowband PMR/PAMR licenses in the 400 MHz ranges while the number of wideband PMR/PAMR licenses in comparison to this is very limited in the 400 MHz range. Professional mobile radio (PMR) systems are part of the land mobile service based on the use of simplex, half and full duplex modes at the terminal level in order to provide closed user group communications. Whenever practicable, the same frequency bands should be assigned in different CEPT countries for land mobile systems for PMR/PAMR as identified in the Technical Recommendation T/R 25-08 that also provides guidance on international cross-border co-ordination issues to CEPT administrations. Harmonisation of PMR/PAMR frequency opportunities is also set out in the European Common Allocation Table - the 'ECA Table' - ERC Report 25. The ECO Frequency Information Database - EFIS - gives the opportunity to search for precise PMR/PAMR entries from CEPT administrations. A list with national contacts on PMR/PAMR from CEPT administrations is provided here. At this stage those networks/systems/on site usage could be digital but also numbers of them are still using analogue transmissions (e.g. MPT 1327) which are less efficient in terms of spectrum usage. The amortisation of such equipment may largely differ depending on the category of usage. Some equipment is staying in operation more than 15 years and there are little benefits for the users to migrate to more efficient technology. The bandwidth requirements of the narrowband PMR sector will increase within the medium or long term future. A possible future evolution towards PMR broadband services raises the need of availability of spectrum resources and the ECC is investigating this. 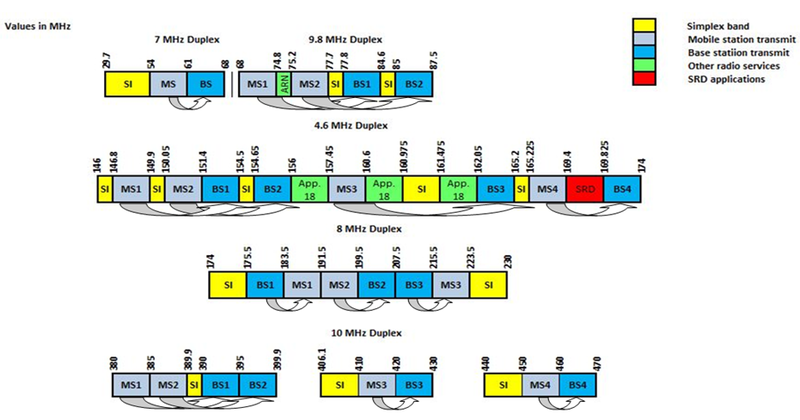 The current spectrum efficiency for analogue PMR is one channel in 25 kHz or 12.5 kHz, while new digital technologies provide a two-fold to four-fold increase to 6.25 kHz equivalent spectrum efficiency such as the technologies standardised in ETSI, e.g. TETRA25, Digital mobile radio (DMR), dPMR. However there is little incentive for users to replace their less efficient equipment. Experience so far with DMR suggests that users use the extra capacity to improve operations (e.g. introduction of data, mainly short messages), so the increased spectrum efficiency does not materialise. The evolution of technologies is expected to follow the general evolution in the radio communication sector. In general, there is a trend towards mobile usage of services that require access to data high or very high speed, driven by increased use of services for image and video applications which consume more bandwidth, such as video surveillance, real-time video, fast exchange of large files (including the exchange of medical information for remote intervention) and access to databases. LTE seems to be a technology that can evolve to meet all or part of PMR needs with channel bandwidths of e.g. less or equal to 1.4 MHz, 3 MHz, 5 MHz or 10 MHz. In order to improve spectrum efficiency, and to promote migration from analogue to digital PMR, administrations may consider identification of a minimum required spectral efficiency to support the migration to digital, more spectrum efficient technology which will allow the creation of additional channel capacity within the same radio spectrum, and support more users. This also provides an opportunity to upgrade radio systems and improve interoperability. Furthermore, based on available digital narrowband PMR/PAMR technology and the national needs, the administration may impose a minimum required spectral efficiency such as 6.25 kHz or 12.5 kHz. Project Team FM54 has been established and focus on work on spectrum issues related to railway applications, especially GSM-R, look at the options for the future evolution of train communications across Europe, the review ECC deliverables on PMR and PAMR and considers the amendment of the regulatory framework for PMR/PAMR in the 450-470 MHz band whereby the scope should not be limited to PMR/PAMR (may also cover other land mobile radio systems, e.g. MFCN) and the development towards LTE technology should be taken into account. The webpage of Project Team FM54 can be found here. The work programme of Project Team FM54 can be found here. Project Team FM54 continues the development of the draft ECC Report on ‘Current Use, Future Opportunities and Guidance to Administrations for the 400 MHz PMR/PAMR frequencies’. A number of input documents focussed on sharing of PMR/PAMR as well as consideration of a supporting spectrum access protocol for this purpose. Considerations also include elaboration of harmonised technical conditions for LTE in the 400 MHz bands (in parts of 410-430 MHz and 450-470 MHz) while not changing the previous balance with the requirements for other radio applications, especially for PMR/PAMR. The 450 MHz Alliance provided a request in PT FM54 to consider LTE in the band 450-470 MHz. PT FM54 will consider setting up a proposal for a compatibility study request for WGFM. Studies are necessary because the impact on other services is not the same as for BB-PPDR (ECC Report 240) due to a different user equipment density and resource block usage. PT FM54 also elaborated necessary modifications of ECC deliverables ECC/DEC/(04)06 and ECC/DEC/(06)06 for narrow band and wider band PMR/PAMR as well as for ERC Recommendation T/R 25-08 (latter one already approved, see above). Another subject is to also consider a possible request to ETSI to consider the development of spectrum access protocols in support of PMR/PAMR frequency sharing in the 400 MHz bands.